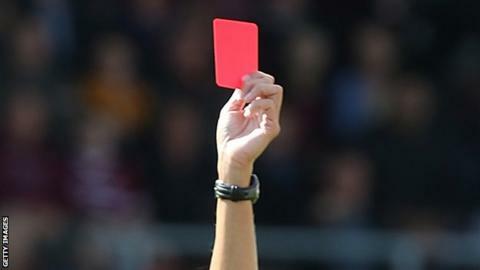 An Austrian footballer has been banned for 70 matches for headbutting a referee. Ismail Gunduz of amateur side SK Rum received the punishment after he reacted furiously to being shown a second yellow card in the 87th minute of a match against SPG Innsbruck West. "We distance ourselves from Ismail Gunduz's behaviour," Rum coach Michael Messner told a local paper. "He was thrown out of the club with immediate effect." Ron Artest (basketball): 86 matches Brawling with fans after a drink was thrown at him. Chris Simon (ice hockey): 30 matches Stamping his skate down on to an opponent's leg. Tran Dinh Dong (football): 28 matches Tackle that left an opponent with a broken leg. The suspension was imposed by the Tirol Football Association, which governs the Tirol Liga, the fourth division of Austrian football. The club was also fined 257 euros (£204). "The barrier of 70 games is certainly a high punishment, but on account of the various witnesses' questionings also defensible," Tirol FA spokesman Horst Scherl told BBC Sport. He added that Gunduz could have been banned for up to 78 matches. Gunduz defended himself, claiming that he slipped. "This sentence is madness," he said. "I will do all I can to return to the pitch."